The film wastes no time getting right to it. After a brief introduction to lead character Allison (Dana Christina), we're thrown right into the lion's den alongside her. And as she traverses the themed halls of the haunt, she's forced to face a different demon of the past, each step forward only adding to the difficulty in exercising them completely. 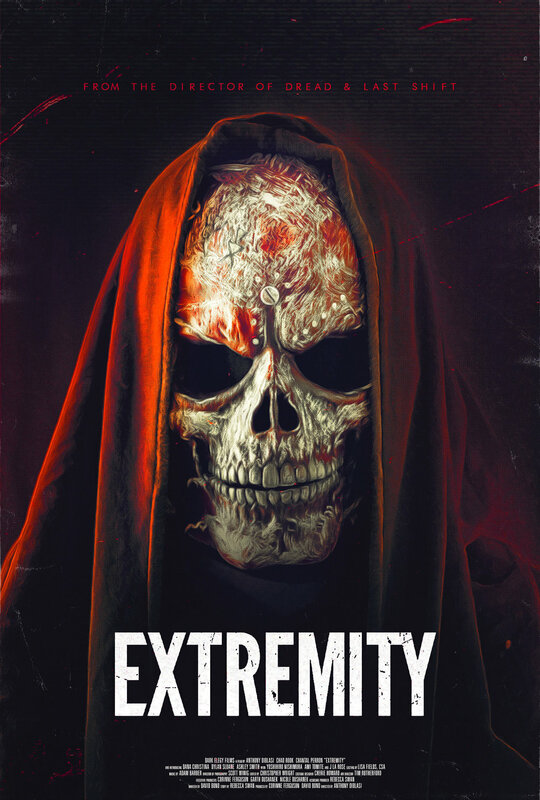 Extremity marches steady to this beat for most of its running time, which is unfortunate, because those moments are the weakest parts of the film. Not to say the first two-thirds are bad (far from it), there's certainly an appreciable amount of backstory and character development contributing to the strength of what's to come, but just that - when it does - you'll be so gobsmacked by it, everything else will seem like the memories of a different film entirely. Seemingly every aspect of production is ramped up in quality; direction, performances, visual effects, score, set pieces, aesthetics, all reach fever pitch, and we're treated to a truly gruesome, highly affecting finale filled with moments that made me squint, squirm, and gawk involuntarily. Better late than never I suppose. I just wish the film was paced more like Last Shift, giving us a steadier climb up to the apex of terror, but perhaps its deliberate. After all, I can't imagine the ending having quite the impact it had if the ramp up to it was less steep. So, even with the minor tonal missteps and odd pacing, Extremity remains a solid recommendation anyway, if nothing else than for its strong premise, unique narrative, and sledgehammer of a finale. Horror fans can participate in the therapy from hell this October 2nd during its limited theatrical release.